So I've been working on this on and off for the past couple of months and I finally found some time to finish it. Here's a list of every single Morlock breed I ever created! Morlock beasts are creatures from another world that can come to earth through a portal that opens between our world every 9 years for 24 hours. They come here to feed on us humans and to claim Earth as their territory. 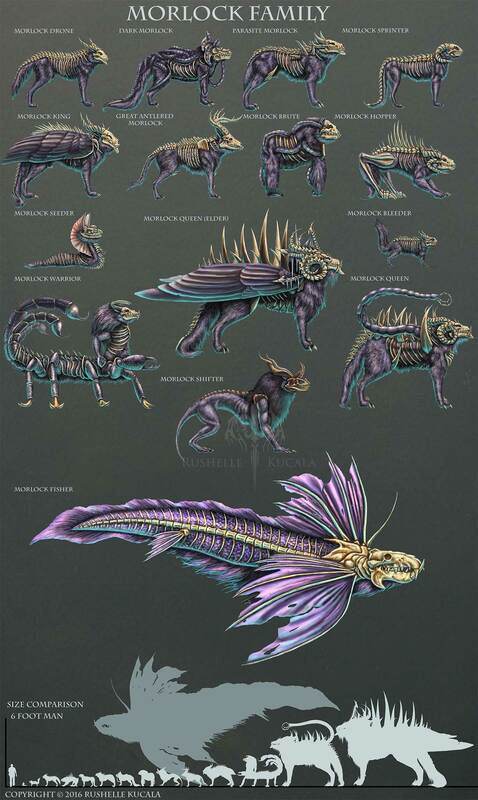 Here's information on each breed and their rank in the pack: Morlock Drones: Morlock Drones are common Morlock breed that doesn’t have any particular ability or high rank. They serve their Queen and take care of the pack. Even though they have no unique ability you should still never underestimate them. Dark Morlock: Dark Morlocks are completely nocturnal. They prefer lurking in caves. If they do come out in daylight they become disoriented and vulnerable to attack. This breed of Morlock has lost their vision, but evolved their sense of smell and hearing far greater than the average Morlock. Their crest also allows them to have infrared vision, the ability to see infrared radiation. The tube like organs growing all over their body can also sense the slightest vibration. These abilities make them the masters at hunting in the dark. Parasite Morlock: Parasite Morlocks have the ability to split their skull open almost like a flower blooming, in the middle is a tiny worm looking thing that they can shoot out at their prey. If the parasitic worm like appendage makes contact with the prey it latches on very tight, while it does this it makes it’s way to the hosts brain and starts to take complete control of the hosts body. As long as the parasite is attached the host is under the Morlocks control. If you try removing it by force there is a chance you will kill the host. There is a way however, if you burn the parasite with a match it may let go and drop off, causing no harm to the person. Scientists have been able to learn a lot about Morlocks by capturing a Parasite Morlock and letting them take over a host in a controlled environment, where they can verbally communicate with the Morlock through the parasite. Morlock Sprinter: Morlock Sprinters are the fastest Morlock breed to ever be discovered. They can run up to 75- 80 mph. They also have a stinger at the end of their tail that injects a neurotoxin into their prey. Morlock King: One of the few Morlocks that cannot only mate with the Queen, but they also have the ability to fly. All Morlock Kings are born male, and are the most common breed that Queens prefer to mate with, hence their name King. They have silent wings when flying and are very swift hunters. They will also stop at nothing to protect their Queen and cubs. Great Antlered Morlock: Great Antlered Morlock get their name from their massive, sharp antlers protruding from their skull. They are also very fast and agile. Morlock Brute: Morlock Brutes get their name from their brute strength. They anger easily and will attack anything in their way. They don’t seem as intelligent as the other Morlock breeds, making them the “dumb brute” stereotype of the Morlock species. Morlock Hopper: Morlock Hoppers get their name for their amazing ability to jump. Their back legs are almost grasshopper like, allowing them to jump nearly 50 feet in the air. They may be excellent jumpers, but they are very slow and can’t run. Morlock Seeder: Seeders are very slug like and have these huge frills that lift up when threatened or about to impregnate its victim. They keep their tongue rolled up in its skull just like a butterfly's proboscis. To keep the host still is injects a neuromuscular paralyzing venom, they also inject 1 or 2 eggs. Infant grows very rapidly, takes 3 days to finally leave the host. Host suffers massive pain, but is kept alive through the whole process. Around the wound is a lot of swelling, bruising, and puss tends to ooze from it. After 3 days the baby finally burst thru the host resulting in a painful death caused from loss of blood and/or infection. Lots of foul smelling puss bursts out along with blood. Although it's one of the tinier breeds of Morlocks it is definitely one of the most feared. Morlock Bleeder: Morlock Bleeders may be small, but their ability makes up for their size. A Morlock Bleeder has venom in their saliva that causes severe bleeding in the victim. The bleeding gets worse over time to the point blood comes out of the victim’s eyes, nose, ears, mouth, and other orifices. The victim will either bleed out to death or the Bleeders will follow the victim from a safe distance until they are sure the prey is too weak to fight and that’s when the Bleeders swarm in and finish their prey off. They are very bold little creatures, not knowing their size they will attack just about anyone or anything. Morlock Warrior: Whenever you see a Morlock Queen you’ll find that there are always Morlock Warriors nearby, this is due to them being their Queens bodyguards. All Morlock Warriors are born male and are one of the few breeds that can mate with a Queen. They have three scorpion-like stingers that can inject venom that causes the victim excruciating pain that can last up to six months. The pain is so bad that people that have been unfortunate enough to get stung have been known to either amputate the limb that was stung or even commit suicide. Morlock Queen: Morlocks live under a matriarchy pack led by a Morlock Queen. She calls all the moves and keeps the pack in check. Only a select few Morlock Breeds are allowed to breed with her. They are very intelligent, some even suspect more intelligent than man. They are also one of the strongest breeds, making them one of the deadliest breeds to have ever been documented. Morlock Queen (Elder): Instead of growing weaker with age, Morlock Queens actually get stronger. When a Queen gets to a certain age they begin a metamorphous. She will start developing five large bony appendages around her skull that grow over time. They are called “the crown” due to their crown like shape. She will also develop a venomous stinger and wings develop out of her tentacles. An Elder Queen also develops the ability to breathe a unique fire never before seen on Earth. It’s green in color that is hard to put out; even water has little to no effect. By this age there are usually two other generation of Queens that rule with the Elder. Elder Queens generally stay back with the pack and raise and protect the cubs, while the mature adult Queen daughter will rule the pack that is taken to Earth to hunt, and the youngest Queen stays back with the Elder. Only a few times has an Elder Queen come to Earth, and when they do they bring destruction wherever they go. Morlock Shifter: It appears that Morlocks are evolving into more unique and powerful species. Shifters are very flexible, they can bend and contort as if they don't have a bone in their body, and they will use that to freak out their prey. They also can walk on all fours and on their hind legs. Being flexible isn't their special ability though. Not only are they flexible, but they can transform their appearance! When a Shifter is near a human, they are able to shift their appearance to look completely identical to the original human. They can only mimic the forms of living things that are about the same size as them, so a human is very easy to transform into. They even sound like the person they're mimicking. They do not share the humans memories, so if you're suspicious of someone being a Shifter, ask them a question only they would know. Shifter's also can't mimic speech impairments, so if someone used to have some form of speech problem and all of a sudden they speak clearly...keep a close eye on them.... Morlock Fisher: Morlock Fishers are an aquatic breed of Morlock. They are very large and fast swimmers. They have extremely powerful jaws that can bite into the side of ships. They also have the unique ability to shoot three long, snake-like appendages from it’s mouth that can bite on to things and real them back into to the Fisher’s gaping mouth. They use these appendages to grab people off of boats or near shore.